Perhaps it was the booming, reverberating hits that Led Zeppelin's John Bonham laid down during the legendary Headley Grange recording sessions of “When The Levee Breaks”. Maybe it was the perfect timing, astounding meticulousness, and creativity of Rush’s Neil Peart, or Keith Moon’s ferociousness as he thundered away with some of the hardest drumming as a member of The Who. No matter which beat hit you just right, drums have a way of making nearly everyone want to play them. They are unbridled, exhilarating and quite possibly the most fun instrument to play outright. However, drums have a lot of pieces, accessories and parts so knowing exactly what to look for within your budget and goals can save you money in the future, prevent headaches from a lack of knowledge, and have you spending more time learning how to smash the skins and less time trying to keep your kit in playable condition and sounding great. Kits come in a variety of packages from entire setups that will have you playing right out of the box and include everything from drums, cymbals, sticks, and a throne. To packages that are just the drums themselves with zero hardware like stands and pedals, or other accessories. Determining a budget and aligning it with your goals is crucial at this step. If you want to simply throw a kit in the garage so that you can get a few minutes in on the weekends just for fun once in awhile. Or you’re really unsure if drums are something you want to invest much money into at all, the ready out of the box options can be decent enough to get you what you need. The thing to remember about these types of kits is that their principal goal is to get you everything you need to start drumming at the lowest price point possible. This is going to mean a low-quality wood is used to make the drums' shells, the hardware will generally be fairly unfriendly and may not hold up against more serious playing, while your cymbals may sound shrill, brittle or just less than stellar. That’s okay though, these kits get you into the driver’s seat without a huge investment up front. However, should you stick with it and progress beyond barely casual, it’s almost guaranteed that everything will need to be replaced sooner than later as you seek higher quality performance and sound and is certainly something to keep should you have larger aspirations. If you want to be the heart of the band, play out (live), or any other sort of more serious beat keeping than it’s likely ideal that you go ahead and avoid an all-encompassing kit and instead focus on getting the best 5-piece drum kit consisting of just the drums themselves (no hardware, cymbals, etc.) that you can afford while still saving enough to get the other things that you’ll need to purchase in order to have a complete drumming set up. Acoustic drums come in a variety of wood types, all offering varying degrees of tonal qualities. High-end drums are often made from Maple or Birch, but Beech, Oak, Mahogany, and Poplar are all popular choices too. What you’re looking for in this range is solid wood, avoiding plywood shelled drums. The difference in both construction quality and sound is evident and you’ll have drums that you can keep in your arsenal longer. Don’t be afraid to try out different types of wood before buying as the bass response, high and mid tones all vary among the different wood choices. A standard 5-piece kit will include a snare, bass drum, two mounted toms and a floor tom. For a new drummer, adding a hi-hat, ride cymbal and perhaps one more crash cymbal is more than enough for the entire kit. Sure, every new drummer wants a cruise ship worth of tom-toms encircling them among an alloy jungle canopy of cymbals to bang on while the double-kick holds down the low-end. When you’re learning though, this will only slow you down in getting the basics under your belt. Stick with the idea that less is more and you’ll come out of the gates learning quicker and forming tighter, more precise grooves. Hardware can be found in sets similar to your drums that will generally include everything you need for the hardware side of drumming. The set will usually include a snare stand, kick pedal, two boom style cymbal stands, and a hi-hat stand. While it might initially seem like skimping on hardware is a great way to save some cash this can turn regretful. The hardware holds everything together, has all the moving parts and absolutely needs to be reliable and since the price variance between the best and the low-end side of hardware isn’t super dramatic, that low-end hardware just isn’t worth the hassle for the serious drummer. If you’re going to be playing live or in a band, it means that you’ll be breaking down your kit often, and that consistent wrenching, adjusting and packing around can destroy cheap hardware. You can nearly bet that it will give out when you need it most too - during set up at the venue, or even worse, mid-song during a live performance as cheap bolts tend to strip, and stands fail under even minute amounts of weight. We generally believe that because of the importance of hardware that performs, getting slightly cheaper drum shells so that you can accommodate better hardware is an overall win. There is an old saying that goes “You can’t tune cymbals.” What it means is that even lower end drums can have the heads replaced and tuned to perfection to hide some of the tonal flaws and even producing pretty fair results. The quality in the sound of the cymbals you choose, however, will remain the same until that brittle “ting” breaks your spirit enough to realize the mistake you’ve made. Cheap hi-hats, especially, can be apparent and obvious from the first hit so just like hardware, it makes sense to not be afraid to place a little budget emphasis in this area. If we can’t have a jungle of cymbals what do we get then? Ask any seasoned drummer where his sticks land the most when it comes to cymbals and they’ll tell you two spots: high-hat and ride cymbal. 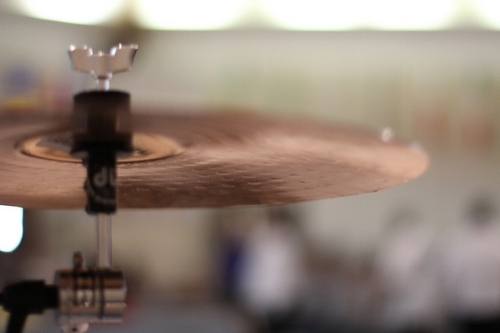 Focus as much money as you can on these two and worry about the other cymbals later or as your budget allows. The rule stands though, less is still more and will keep you honed in on drumming rudiments that will ultimately create a stronger drummer. The mathing has already begun in your head, hasn’t it? Drumming is certainly one of those passions that can quickly become very expensive, so keep a grasp on your overall budget while also planning for extras that you probably didn’t think of. Upgraded heads, tuning pegs, sticks, earplugs for your sensitive ears, and earplugs for your loving family as you begin your aural assault become essentials. Plus no aspiring drummer is complete without a take anywhere practice pad. The band is going to book big shows, you know, so don’t forget an entire set of cases, either soft or hard to get your prized shells and gear to the show in pristine shape. Brushes for the jazz hands and mallets to slow it down. Even your food budget is going to go up because the band always practices at the drummer’s place and you know how much Dave loves anything that’s in your fridge. Even if your bandmates manage to bring their own food, keeping a little change on the side for all the extra incidentals, gadgets and trinkets will have you feeling better when those things do come up. Drumming is one of the greatest ways to experience being a musician, a pure riot from nearly every account. But it also brings its own tangible things to consider when buying your first kit. It can seem overwhelming, but with these tips, you can go into buying your first drum kit with a better idea as to where to focus when deciding how to spend your hard earned money, what to avoid and perhaps more of what you want overall.